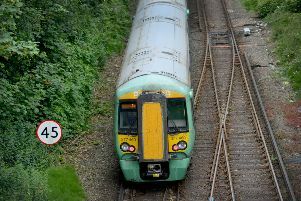 Alarming new figures from Network Rail and British Transport Police reveal more people than ever are risking their lives on the rail network by trespassing on the tracks in the south east region. Last year alone there were around 1,118 incidents where people risked their lives on the rail network in the south east – a 17 per cent rise on the previous year. In Sussex, the statistics show that there were 153 incidents last year compared to 128 incidents in 2012. Nicola Dooris, Network Rail’s community safety manager, said: “Every April we see a huge rise in the number of people taking a risk on the rail network and it’s worrying that these numbers seem to be going up. “The dangers may not always be obvious but the electricity on the railway is always on and trains can travel up to 125 miles per hour, so even if they see you, they can’t stop in time. “It may seem harmless to take a shortcut, or fun to play on the tracks, but this is not only illegal, it is also very dangerous. In response to the seasonal surge in incidents and to tackle the problem of youth trespass, Network Rail has launched a schools engagement programme, which aims to teach children in trespass hotspots about railway safety. The ‘Tackling Track Safety’ programme will be rolled-out to more than 100 schools across Britain, using sport to educate children about the dangers across the network. In 2016, 12 children in West Sussex and seven children in East Sussex were caught trespassing by police, with boys aged 14 to 16 being stopped the most. Chief Inspector Sarah White from BTP in the south east said: “We believe the number of children we encounter trespassing every year is sadly, just the tip of the iceberg. “That is why we are urging parents and young people to heed this warning and take a reality check when it comes to trespass. New figures also highlight that youth trespass is more prevalent in areas where there is higher socio-economic deprivation. To help tackle this Network Rail has joined forces with children’s charity Barnardo’s to deliver safety education in specific areas of need and where trespass rates are high. The organisation will be raising money for the charity and encouraging their staff to volunteer and help deliver these safety events.